I am in the process of doing the water pump on the 86.5 I recently acquired. When I removed the water pump I was caught off guard by the color of the block inside the water jacket. At first glance I had thought that someone had done an epoxy repair on the water pump impeller surface, but then upon further inspection I realized the entire internal surface (that I could see) was all a much darker grey/silver and the rest of the block. I am now suspecting that someone may have used some sort of stop leak on it, though the coolant that came out was perfectly clean and showed no signs of contamination. It also has the remnants of what appears to be some sort of green label/paint that I haven't seen before. Any other thought on what may have caused the discoloration? I wonder if your car had a leak elsewhere and they were trying to stop it, i.e. a head gasket leak? I know it's a tall order, but can you see any past signs of coolant seepage down the sides of the block? Since you have not yet pulled the block drain plugs, I'd do that and see what comes out. I was planning on pulling them, but didn't get a chance last night. I'll have to try to get back out and spend some time in the garage this evening and see what I find. I'll try to get pictures if I find anything interesting. Many common "cooling system cleaners" are caustic-based, and will stain the block dark gray if not completely flushed out after treatment. Stick an inspection mirror or you ore-scope camera into the bottom radiator hose port on the radiator, and see if that area is damaged too. I'll lake a look at the radiator as well when I get back to it. My primary concern is of course with the engine, however the radiator could be a great indicator as to the health of the over all system and what may have happened to cause the engine discoloration. Well I removed the block drains last not, with surprisingly little drama. It did however disprove my theory that the PO's mechanic didn't know of the existence of anti-seize. 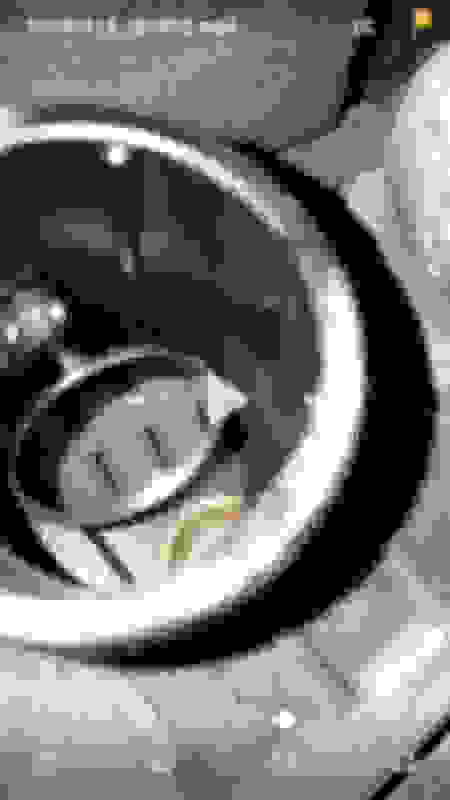 Removal of the drain plugs was followed by a few ounces of clean antifreeze on each side, and the drain holes themselves appear to be clean and unobstructed. I also looked around for any signs of previous head gasket leaking, but found nothing. 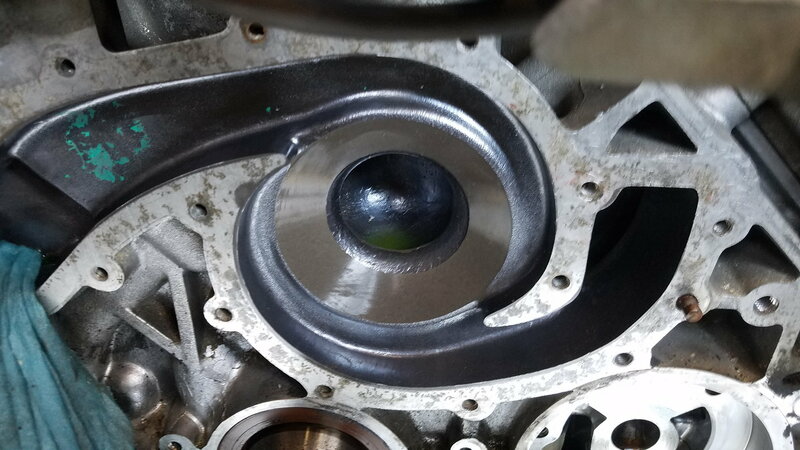 the valve cover gaskets however seem to be weeping a bit as the heads above the block line are a bit oily. I also did my best to look into the lower radiator to check the condition of the core. Again all appears to be in quite good shape. Not the best picture as it is a screenshot from a video, but it shows the core condition via a small round mirror I had the fit into the lower radiator fitting. Over all the system seems to be in good condition, so at this point I will probably start putting it back together, unless anyone can think of anything else I should investigate further. The radiator DOES look good. I'd wait to do the gaskets until we are doing your top end, which if I'm guessing will be shortly following behind the WP/TB. Let me know if you need an extra hand.